Yeah! Here's something new and finished! And I can show it to you. I didn't draft the slopers for J's jumpsuit today. Instead, I decided to make a quick knit top. I am really reconsidering my choice in tops this summer. For years, I've been happy with fitted t-shirts and tanktops with small variations. I guess the tanktops will keep hanging around for that real summer weather, but I find myself falling out of love with those skinny t's. 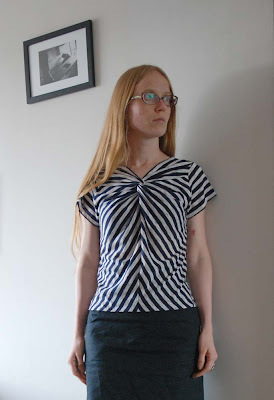 Anyway, my latest top is another take on the twist top (by the way, I made that as a muslin for my twist dress, but I have finished it and I've worn it a lot last summer). This time, I put the twist much higher up on the bodice, making it more of a neckline decoration. The fit in the body is the same as the one used on my colour-block top, but I kept the normal armscye for a set-in sleeve. The sleeves are adepted from my normal fitted sleeves. They are much wider, with a rather low sleevehead, making for a look which is fairly common on t-shirts. I chose the stripey fabric to set off the twist design but I was afraid this particular version might be horribly see-through. As it turns out, there was no need to fear. I have some of this fabric left and I may just make a fairly normal t-shirt out of it because I like the back view of this one. The one weakness of this top has to do with the stretch of the fabric. It doesn't stretch anywear near as much lengthwise as it does in every other direction which causes some hang-and-drape issues with the bias front. Which was caused, of course by my idea that a chevron-front would be fun. Unfortunately, there hasn't been much sewing I can I show to you. I've been at work and working on assignments when I wasn't. The good news is that the assignments are going well. J came around to try on her almost-finished jacket (all it needs is to have the lining put in), which fit her well and she loved it. Another friend J stopped by to have her measurements taken for that demin jumpsuit. I have good hopes for that one and I think I will be able to make her the necessary trouser- and strapless bodice slopers over the weekend (Queen's day, 30 April, is to the Dutch what the British would call a Bank Holiday, so I won't have to work this Saturday). 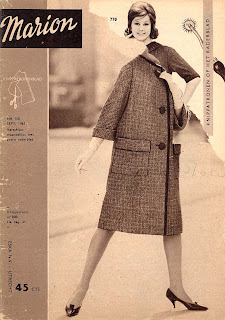 Oh, and I still want to make E that spring jacket, although the weather already dictates summerwear. I don't think I will let that deter me. Despite the 'warm summers follow harsh winters' common wisdom, there's absolutely no garantee that we won't have a wet and chilly month of May. And if we get nothing but summer, he can always wear it in the autumn. But, it has been a good week for the bookshelves indeed. 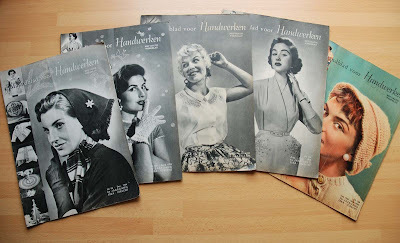 On Monday I met my aunt, who gave me her latest 'harvest' from the charity shop: Dutch craft magazines from the mid 1950's. These are not about sewing. they're about knitting, crochet and embroidery. 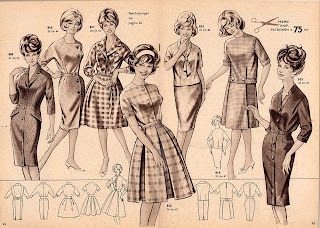 Sadly, all of these are missing their worksheets which would have contained the sull-scale embroidery patterns and the occasional 'sew and decorate' sewing pattern. 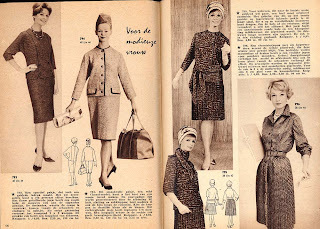 However, the pictures are pretty nice and I think (with my very limited knowledge of the subject) that most knitting patterns could be made from the texts and small diagrams included. And then, today, the mailman brought me my latest order from Amazon (I use the 'co.uk' site. They even have free shipment to the Netherlands now). I had been promising myself a book-buying-spree ever since I started my teaching job. But I was waiting for a history book which should have been published in the second half of 2010 but still isn't avaible. I got tired of waiting and now, I can welcome these to my home. From left to right, I've got: Patterns of fashion part 1 (I'm not really into recreating historical garments, but I love patterns and I thought it would be great to see those of historical garments. 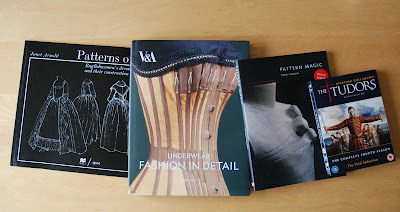 who knows when I will want to use some element from those), the V&A publication Underwear in detail (I love all their 'in detail' books. 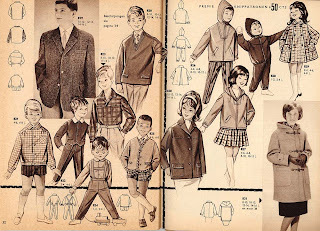 Excellent detail pictures, clear line drawings and the appropriate information), Pattern magic 1 (no need to explain this one, it's been all over the blogosphere and I decided to give it a go. I didn't even check when I ordered it, but this is the new English version) and season 4 of the Tudors (did I tell you that history is my other weakness?). From the very day I finished the jacket, E has been busy. Very busy. Way too busy to take pictures of me wearing the jacket. Until today. When investigators arrived at the scene, they were once more baffled by the variaty of eye-witness accounts. 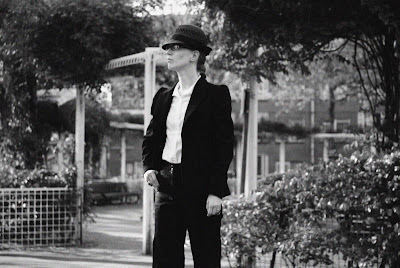 And yet, in the bright light of day, nothing could be found except a girl in a dark suit. I've been thinking of doing a post like this for a while but as you may know, Gertie has beaten me to it. But that's not going to stop me from adding my twopence. As a child in the 1980's I think I owned and wore a jumpsuit. A pink one with buttons down the front, which my mother had made. As far as I know, I have no pictures of it. 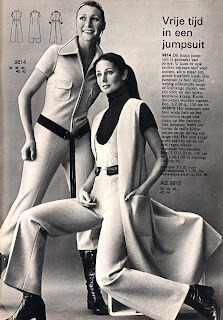 After that, jumpsuits went out of fashion and I never thought about them anymore. In recent, more fashion conscient-years, jumpsuits have been inhabited the same black spot in my sense of style as those other 80's favorites: leggings and tunics (although I did still wear leggings in the early 90's, I haven't embraced their recent revival). However, jumpsuits are not a one-era phenomenon. Gertie showed great examples from the 1930's, which were news to me. 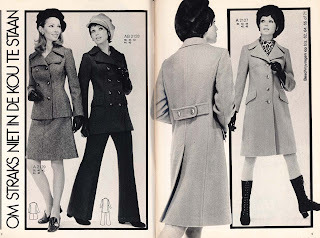 The were utilitarian styles in the 1940's (of course, those were meant to work in) and they were hugely popular in the 1970's. That much is shown, not just by my thrift store find but also by their presence in the 1970's issues of Marion. And by this denim number which I will be knocking off for a friend (the original isn't in her size, she sent me the picture last year and I don't know where it came from). 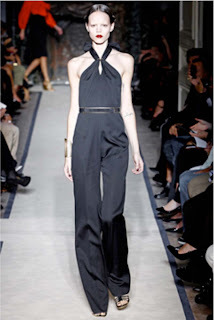 And now, it seems, the jumpsuit is back. Of course, it's been on the verge of a come-back for over a year. 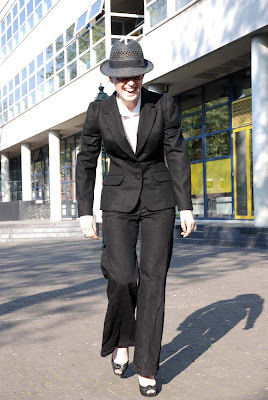 Occasionally one might be spotted in a glossy fashion magazine, or on the back of some daring person in the street. And now, I want to make one. Not one of the kind you see most, like this (from H&M, just one of many in the online store. which really shows just how big the jumpsuit is for this season). I'm not a fan of that overall baggy look... Although it does solve the biggest fit problem of RTW jumpsuits: torso length is way more critical than with, say, trousers or dresses. Having loose and blousy bits on top ensures no problems with that. No, I prefer the kind of silky jumpsuits Gertie described. And as much as I liked a lot of her examples, she missed what I consider the best I've seen so far. 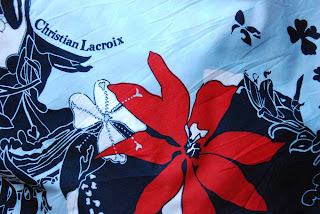 This one, from the Yves Saint Laurant spring/summer 2011 show. I might not be above trying to create a knock-off of that... Sleek, silky and glamourous. lets. Especially when I'm passing them anyway. There are three stalls at my local market which sell second hand clothes. At low prices. As usual for this kind of outlet, they sell the good, the bad and the ugly and anything in between. I have bought lots of gloves there. And a couple of handbags. And a few scarves and silk blouses (some to wear and some to refashion). Oh, and two coats. And a dress. And some hats. However, last week when I was there, they had this 1970's jumpsuit for sale. For 5 euros. Although it's 100% polyesther, I thought it was fun. And I though it would be sort of my size so I bought it. If I am to wear this, it needs to be taken in. Mostly in the sideseams at the bust and waist, a little at the hip. And those princess seam at the bust will also need some tweaking. Although the white part is lined, I think it's do-able. I sort of like this thing on me, but I may also decide to pass it on a friend who's a little bit bigger. Then this week, they had this on the stall. I thought this one had gotten away from me... They'd had it there before but I didn't buy it then because of the price. Now I bought it at 15 euros. Still the most I've ever spend there, but hey, this is a genuine 1950's dress. In almost my size. Full circle skirt in flock printed organza, with a layer of tule and a lining underneath. Bodice decorated with tule ruffles... A party dress. The size is a bit puzzling. The seller labeled it as 'XS' and the original tag says '40' (that's size-inflation for you...). On me, it's a little bit too big (about 3 cm in all) at the chest and more so (about 6 cm) at the waist. This is strange because I know I'm flat-chested and 50's fashion is known for its smalls waists. My guess is that, despite it's '40' size tag, this dress was ment for teenage girls and, for that reason, not drafted to suit the bust of a grown woman. As a result, it looks nice on me when worn with a belt. It's not very comfortable though. The waist seam has been serged which allows you to feel the prickly ends of the tule. The shoulder straps are the right length for me but at the inside of the dress, there are obvious signs that they've been shortened. It has four boning channels to give stability to the bodice but three of the bones are missing. All those stiff synthetic fabrics seem to do their job quite nicely without them though. And of course, it has a metal zipper. They don't make them as fine as this one anymore. Because of its finishing, I don't think this was ever an expensive dress, but now, it's a rare surviver so I'm happy to have it. Spring has made a quite convincing start here in the Netherlands. For the past couple of weeks, we've enjoyed sunny and dry weather, unusually warm for this time of the year. some thought into trouser-based outfits. The point is, in colder weather I've been perfectly happy wearing trousers with simple top covered by interesting cardigans or jackets. Now that it's warm enough to loose the cardigan or jacket, my selection of tops is looking a bit drab and boring to me. Too much black and not enough nice shapes. In fact, it seems like all my basic tops are fitted t-shirts (apart from last year's free form experiment tops, which I still like). This is a very easy top. Literally a T-shape, with cut-on sleeves. I wanted to try colour-blocking and I love the coral red which works surprisingly well with my skin tone/hair colour. Because I was making a sort of yoke for the colour blocking, I wanted to eliminate the shoulder seam. To do that, I made a V-shape on one side of the upper piece. One side, not front or back. I did the, for me, most unusual thing with this top. Both sides of it are completely flat. No shaping at all, no difference between front and back, making it reversible. 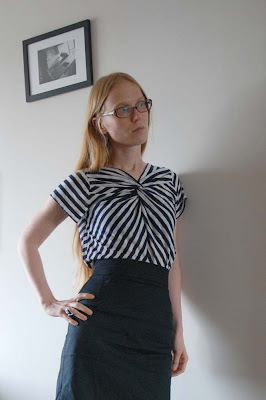 I like the look of the top when it's worn tucked in a high waisted pencil skirt, like in these pictures. Although I think I can also wear it hanging loose, and paired with trousers. I wanted to make a hip-band at the bottom, but didn't because I thought that would show when the top was tucked in. I may do that on another version though. 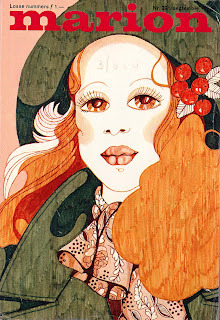 Today, I will show you some of the pages from the issue of Marion magazine for September 1972, published 11 years after the one I showed last week and the most recent of the magazines my aunt gave me. The set-up of the magazine hasn't changed much in those 11 years. The size slightly bigger, there is definately another illustrator at work and almost everything is in colour now. But, on the other hand, there is still only one pattern in each size included in the magazine with the rest available by mail order and designs are shown in photographs or in drawings. Oh, and size inflation has struck: the old size 36 is now 34 and so on. 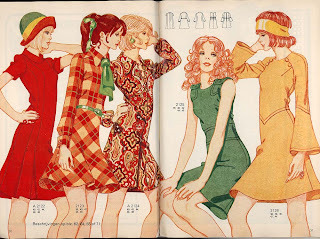 Although some of the 70's magazines have maxi-dresses, that doesn't seem to have been the 'in' look for September 1972. There is an almost enless parade of colourful mini-dresses. And these suits and coats, which I like best from all the designs in the entire magazine. 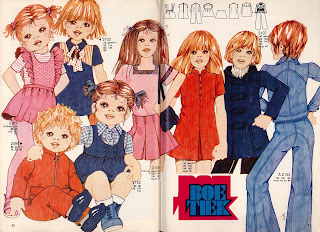 Of course, there are still clothes for children as well, although I'd be spooked by these crazy-eyed illustrations. And there's something I don't think I've mentioned before: there are plus-size designs. Apperently, they took this seriously because every magazine has a fairly wide selection of these. And it looks to me like they have taken a bit of care in finding styles to flatter a fuller body (although it is obvious that they believe larger sizes are for older women...). Oh, and there's a pattern in my size. 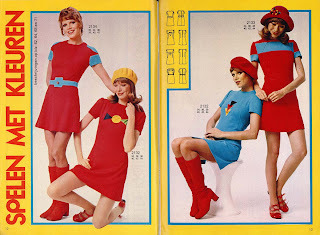 By the early 70's Marion must have been acutely aware of the existance of a teenage target audience because they've done away with the sharp divide between women's and children's wear. The new size 34 is considered the same as the largest size for girls, but there is a section with patterns, meant for young women, available in sizes of about 34 to 40. The dress on the left is included in my size. Anyway, you'll hear from me in comments again as soon as blogger lets me. This is one of my favorite dresses. 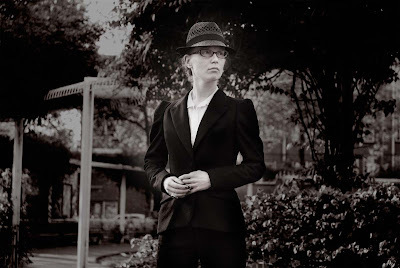 It pre-dates this blog by more than a year (in fact, it's Burdastyle page is from 31 August 2008. Which may be when it was uploaded or when they changed the site...). 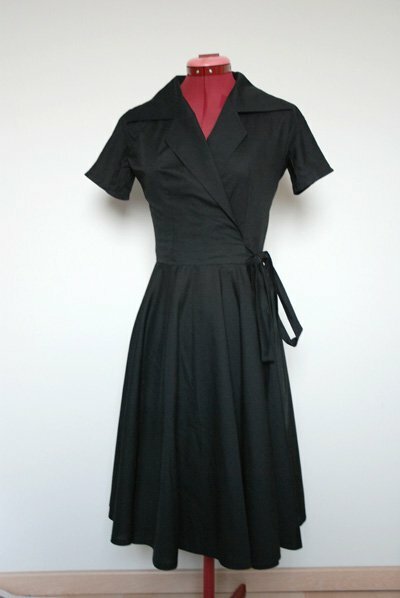 It's a wrap dress made from simple woven black cotton. 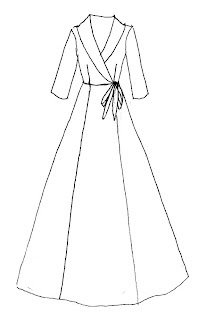 It has a bodice with a notched collar and kimono sleeves with underarm gussets and a big full circle skirt. 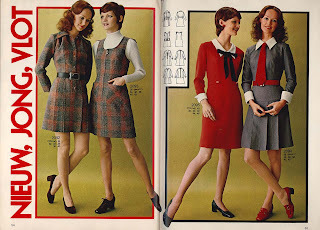 I remember wrap dresses were a huge trend that summer but most were collar-less jersey things which were famous for working 'for every body shape' but absolutely didn't work for my flat-chested frame. So, I set out to make a wrap dress which would work for me. And have a bit of a retro touch. And include a technical and design detail I hadn't tried before (those sleeves). I loved it when I finished it and I still do. I have had to repair the sleeve gusset once (because I didn't reinforce the fabric before setting those gussets in. hey, it was my first try at something like this) but I've worn it a lot and I have used the pattern again as a starting point for last summer's turquoise dress. Normally, I don't think about 'day to evening wardrobe options' but amoung my clothes, this dress would be just that. Many of you may prefer colour, but black dresses are very versitile. A minor change in accesoiries really can allow me to take this dress almost anywhere. I'm thinking about all this because it's warm enough now to wear it again. And I did so on Monday, when I was teaching my sewing class. I am teaching that class at a local highschool (which is not a normal highschool but one which teaches students who are new in this country the Dutch language and some other skills which will allow them to participate in the regular education system after one or two years) and my students come from all over the world. They are very enthousiastic about learning how to make their own clothes and they know I often make mine. Not a single one normally wears a silhouet like this but within a minute of me entering the room, I was surrounded students who wanted to know about the fabric, the bow or the dress in general. 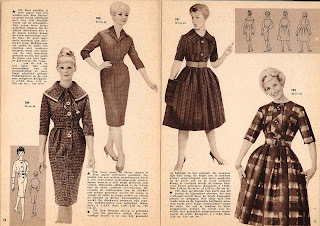 I've always had the theory that girls like 50's style dresses because those have the quintessential 'dress' shape. I just thought that instinctive liking ended when 'fashion-consciousness started... Apperently not. So, at heart the same dress, but different in almost every detail. When I make it, I may just try and grade it as well. After all, out of all my creations on Burdastyle, none has received more requests for the pattern than the black wrap dress... It would be a lot of work and I'm very busy, but it would be nice. This really is 'Mad men'-era stuff, people. Lots of adorable dresses which I'd wear in a heartbeat. And not just for women, there are also children's patterns. 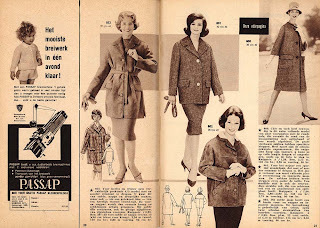 Now, of course this little magazine doesn't contain the patterns for all of these gorgeous clothes. 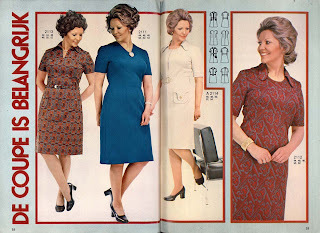 Most of the pictures merely advertise patterns you could order but they've included the patterns for a selection of clothes. One in each size on their sizing table. Other sizes were avaible by mail order as well (I think this explains why, in most of these magazines, the pattern sheet was still stapled in). After some searching, I found the sizing table, and then the pattern included in my size. I don't think I believe that people used to be smaller/thinner anymore. Of course, despite the fact that it's shown on a pre-teen looking model, this is an adorable dress, and I may just try and make it anyway. If I stop for minute and think of it, most sewing bloggers will show you their fabric, their patterns and the garments created from those. Now, I don't often show you my patterns for obvious reasons. I make my own, so getting the same thing is impossible. And I only do how-to's if I think it's pattern which can be made by someone without serious drafting skills. It will be clear to anyone that I am showing you the garments I make. It's sort of hard to miss because those make up most of my posts. 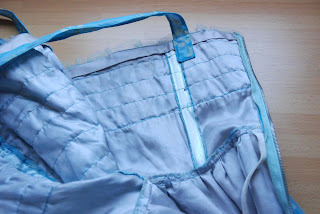 And sometimes, usually with more involved projects like the jacket, I even remember to blog about the work in progress. But why don't I show you my fabric? So, I'm not going to spend more of your and my time fretting about reasons. I'm going to show you the fabric I bought last week. 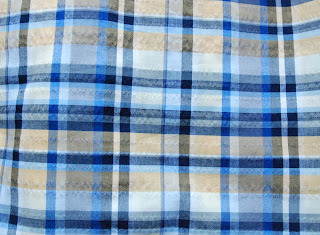 I bought 3 meters of this madras check with the interesting seersucker-style puckering in the weave. I think it's a good quality fabric but the obvious projects to make with it would be rather preppy looking. I will have to come up with a very different way of using it to make it work for me. I'm think about a slim shape with the fabric gathered or draped on. I also bought 3 meters of this rambling floral with its almost nautical colour scheme. This cotton is very soft and drapy and I think it might work very well for me in different kinds of garments. And in the upper left corner, there's a fun little detail... No idea whether or not it's the real thing. 1.5 meter of raw silk in a changant colour of gold and bright green and 2 meters of silk charmeuse in coral red (the colours are much more vibrant in reality than in the picture). 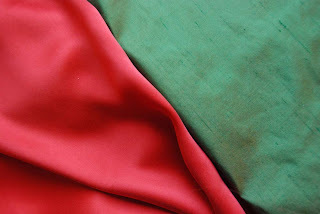 I plan to make a fitted, shift-like dress from the green and something nicely draped from the red fabric, but I'm still pondering the details. As usual when fabric shopping, I wondered about what else I might have and maybe should have bought the moment I walked out the door. But my stash is big enough. And at least I did get some silk, which is not a standard fabric for me. And we'll go again before the shop closes. 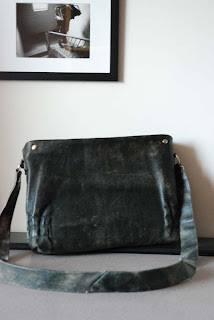 I made a 'new' leather bag. 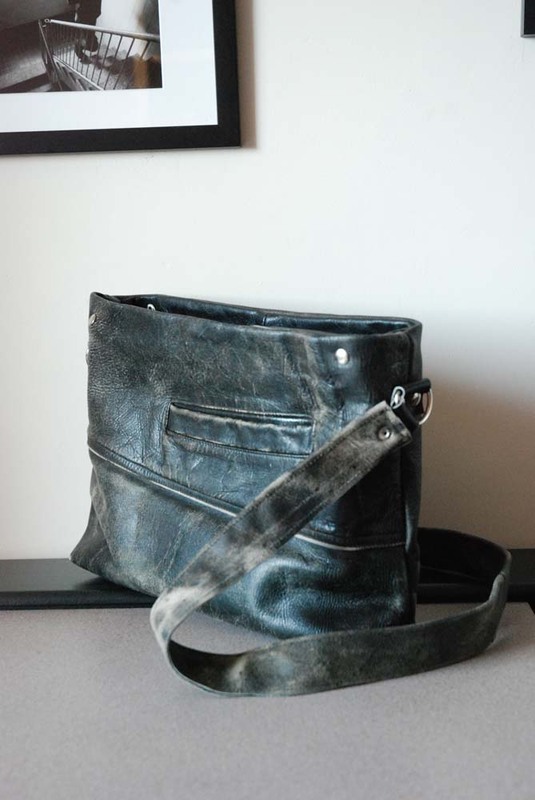 In fact, the bag is new enough but I made it from about half of an old leather motorcycling jacket. 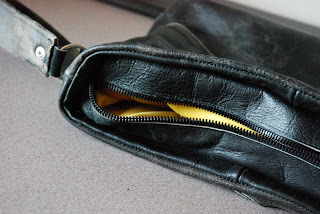 I already used the other half for a bag for my father. I just added a sturdy zipper, rivets, D-rings and a lining. and unpicked the elastic at the back in order to have enough material for the new back. And I made the lining out of some yellow cotton. 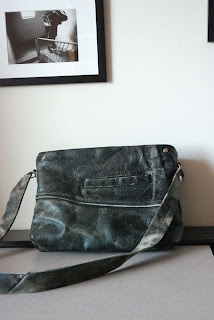 It's quite a tough looking bag so it will be interesting to see how well it works with my usual 'look'. Although I usually pick my bags for practical purposes rather than for style. I've emailed both to lucky ladies, so as soon as they send me their snail mail adresses, both magazines will be off to new and welcoming homes!